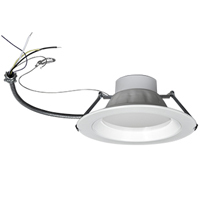 Energetic Lighting’s ELDLf series of LED downlight retrofit kits provides an elegant solution for converting existing recessed cans into LED fixtures. dimmable down to 10%. Comprising of a durable die-cast aluminum construction and a LED lifetime rating of at least 35,000 hours, this durable worklight is designed for many years of reliable operation.